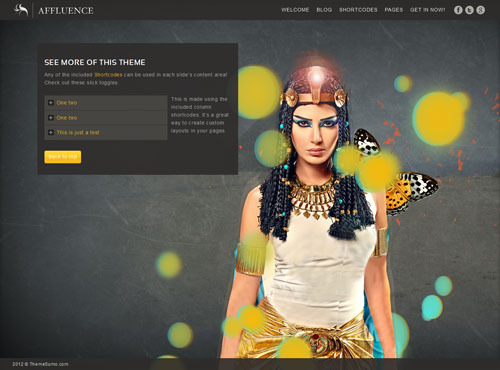 This is a roundup of new premium WordPress themes released in September 2012. We have quite a variety of different designs including magazine, video, portfolio, business, ecommerce and more from developers such as WooThemes, StudioPress, ColorLabs, Viva Themes, Gabfire Themes, Organized Themes, PageLines and others. We will be updating this post with all the premium themes as they are released so be sure to check back or subscribe for updates via our RSS feed, our Twitter account, or the PremiumWP Facebook page. Nimble is a modern multipurpose WordPress theme that is retina ready, fully responsive and optimized for mobile devices. This premium commercial theme is available in the ThemeForest Marketplace. The theme has a beautiful clean and minimal design with an impressive set of features and power to customize every aspect of its layout and appearance. The multipurpose design means it could be used to build a big corporate website with lots of products, a smaller studio website, technology, photography, business or any other type of website you like. Some of the features include: 16 different skins out of the box (colour schemes), retina ready graphics, 6 different slideshows, easy to use layout builder to create almost any page layout you like, 18 page templates, lots of custom post types (for photo albums; portfolio; catalogue; video; team; benefits; testimonials; partners etc), custom widgets and shortcodes, powerful theme options / customisation tools and more. Responsive Visual from Organized Themes is a unique WordPress theme design for a visually enticing website. The home page features a slideshow that supports both images and videos, and you can also add slideshows to your posts and pages. You can show you photo galleries and videos in a unique content panel. It has built in MailChimp support, staff section, theme options panel and more. The theme also has a responsive design so will automatically adjust to look good on all screen sizes and mobile devices. 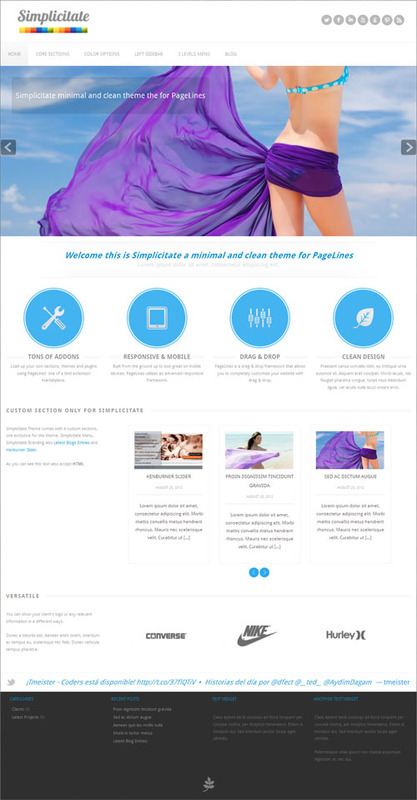 Simplicitate is a clean and minimalist child theme for PageLines that is available for purchase in the PageLines store. The theme has a multipurpose design that could be used for any type of website. It is responsive and features 4 custom sections, 10 colour and background options, Kenburner Slider adaption, latest blog entries, colour for highlights, as well as all the other great PageLines features. 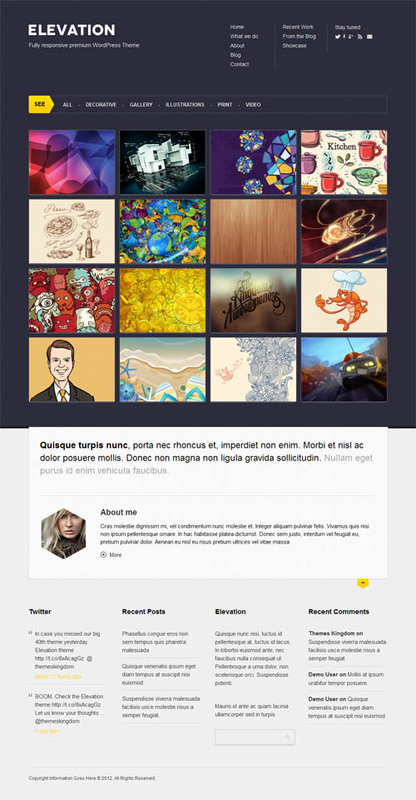 PageLines is a responsive, drag and drop framework for WordPress with Bootstrap, CSS3, and HTML5. The cutting edge theme framework is designed for both new and pro users, and allows you to easily build virtually any type of website you can imagine. It integrates all of today’s popular web standards, has stacks of features and gives your website relevance & room for growth. Elevation is a responsive WordPress theme from Themes Kingdom. The premium theme allows you to showcase your products or work in stylish and professional design. Features include a fully responsive design so it works on all screen sizes and mobile devices, custom theme admin options panel, custom portfolio template, shortcodes, integrated Google maps and more. Concept is a minimalist portfolio / business WordPress theme from Viva Themes. The premium theme has a clean professional design ideal for showcasing your business and products on the web. The homepage has a large slider, 3 widget locations and section to showcase your latest portfolio entries (optional). The theme also features a portfolio page template and gallery slider for each portfolio entry, custom menus and background,, integrated blog, theme options panel and more. Connect is a combo WordPress and BuddyPress theme to build an online news or magazine website and a social network all on the one site. 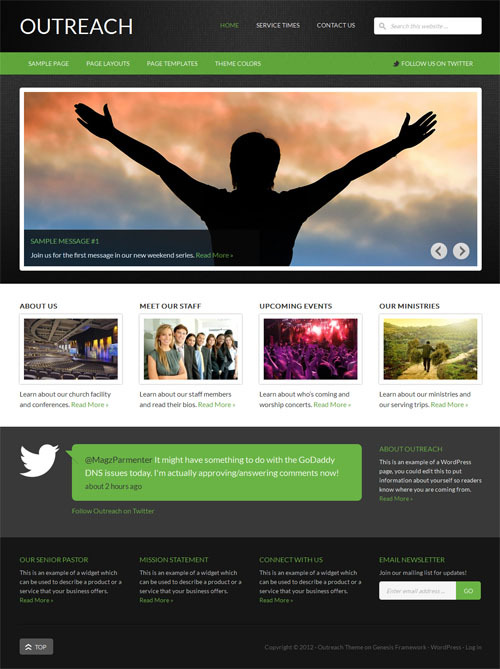 The premium theme from Gabfire Themes allows you to create a stylish and professional news or magazine website and have a built in social network that allows your members to socialize thanks to BuddyPress integration. It has a fully responsive design so will work on any screen size and device (table, mobile phone, etc). Other unique features include 5 category layout options, mega drop down menus with category specific advertisement option, 3 post templates, shortcodes, advanced control panel and more. Beauty Magazine is a versatile premium WordPress theme from Clover Themes designed for fashion, beauty, style and women’s news / magazine websites. With a few colour tweaks it could also be used for tech, sports or any other online magazine website. Features include a custom homepage layout, Adsense / advertising placements, social ready, easy theme options panel and more. 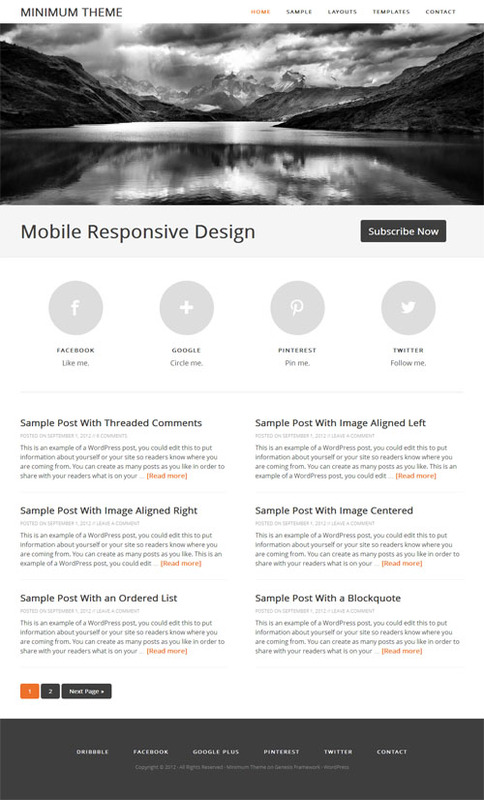 Report is a responsive magazine WordPress theme from MyThemeShop that could be used for any style of website. The theme has a trendy dual column layout and a bold, crisp design and colours. It has a fluid responsive design so will work on devices and screen sizes. Other features include a featured content slider, unlimited Google fonts, unlimited colour scheme options, integrated social media, custom widgets, options panel and more. Burogu is a blogging WordPress theme from ColorLabs that utilises WordPress post formats to let you blog like Tumblr. The theme supports 10 post formats (video, image, quote, link, aside, gallery, status, audio etc) so you can easily share your content. Other features include a large slider on the homepage, masonry and infinite scrolling, 3 sidebar layout options, portfolio page, theme options panel and a mobile responsive design. 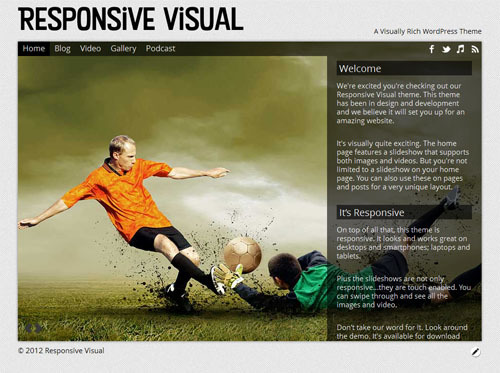 VideoPro is a professional video WordPress theme from Theme Junkie. The premium theme is ideal for video sites but can also be used for news, magazine or any other type of website. It has a clean and professional design with a stylish featured slider on the homepage. Other features include automatic video thumbnails, custom shortcodes, ad management options, custom page templates, advanced control panel and more. Outreach is a responsive child theme for the Genesis Framework from StudioPress ideal for church, organization, non profit or small business websites. Outreach version 2.0 is an update of the original Outreach theme and includes major code and design updates as well as being updated for mobile responsive design. 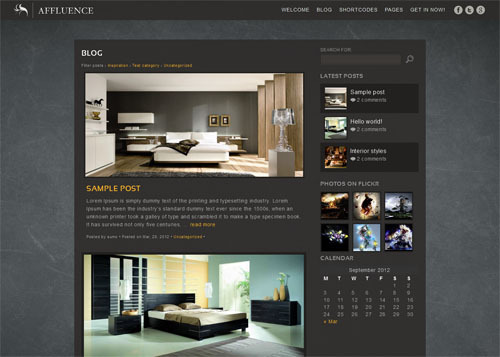 The theme features include 6 layout options, custom background, custom header, theme options, featured images and all the other great Genesis Framework features. A resume WordPress theme for the Builder theme framework from iThemes. The child theme lets you easily create and online resume, ideal for those seeking employment. The theme comes in 3 colour variations and is powered by Builder. Builder’s layout engine lets you creating layouts and widget areas exactly the way you want. And child themes (like this one) handle the design, typography, colors, spacing and overall style . And if you change to a different child theme in the future, the layouts of your site and your widgets remain the same. Plus, you can use Builder’s style manager plugin to make tweaks to your child theme without digging into code. Gamma is a clean and modern multipurpose WordPress theme with a responsive design. This commercial theme is available in the ThemeForest Marketplace and could be used to create a corporate website, a portfolio or a simple personal blog or website. The main aspect of the theme (portfolio, services, staff, faqs, slider…) or controlled via custom post types for easy management. It has a drag and drop homepage with lots of useful modules such as staff, services, portfolio, highlights, blog posts, static page and widgets) and 5 extra “custom” modules you can use to add any HTML , text or shortcodes you wish. Gamma also has a lot of other useful features including unlimited accent colour options, unlimited filterable portfolios/services/staff pages with 2-5 columns, 2 blog styles, font icons, shortcodes inserter, powerful theme options and a responsive design so it works on everything from desktops to mobile phones. 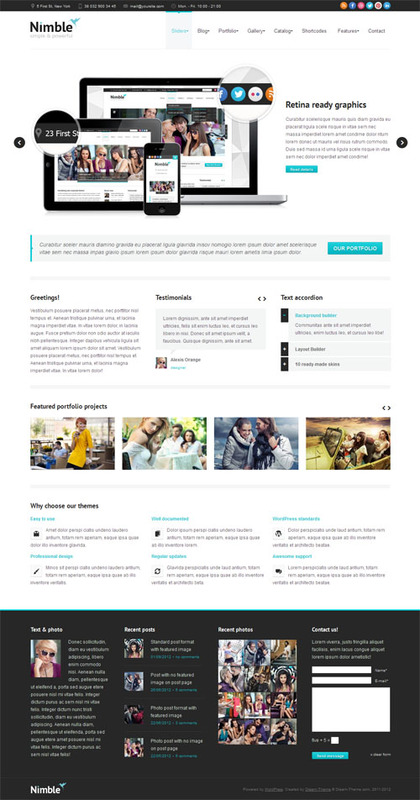 PixelMag is a responsive 3 column magazine WordPress theme from MyThemeShop. The theme has a structured 3 column grid layout that displays posts in rows and columns, allowing users to see the most posts as possible on the homepage. It has a responsive design so works on all screen sizes and mobile devices. Some of the other features include a detailed options panel, custom widgets, shortcodes, related posts and optimisation for search engines and speed. Hydrogen is a business portfolio WordPress theme from VivaThemes. 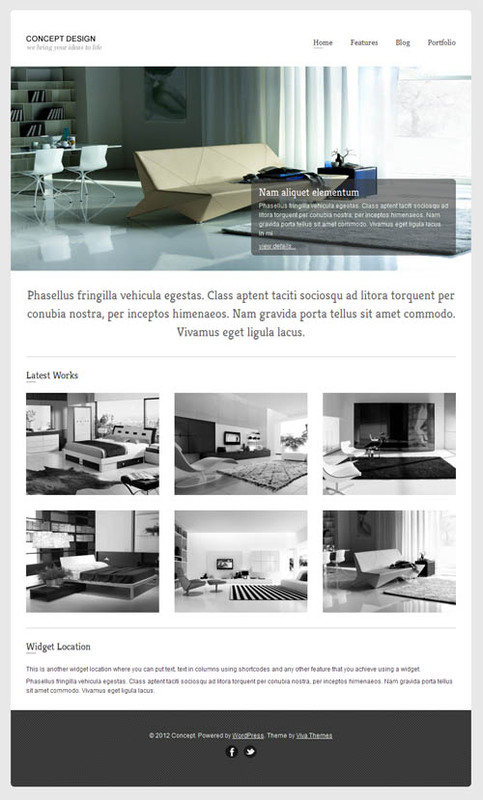 The premium theme has a clean and flexible design which could be used for a business, portfolio or personal website. It has a 3D jQuery slider on the homepage, with an optional portfolio slider. Other features include a portfolio page template, gallery slider in portfolio entries, blog, custom shortcodes, theme options panel and more. Affluence is a parallax WordPress theme from ThemeSumo which allows you to create Parallax effect pages for any type of interactive portfolio or presentation. Parallax is the effect whereby the position or direction of an object appears to differ when viewed from different positions. This technique is used to create the illusion of depth for a 3D effect on websites. The Affluence theme allows you to create as many slides and parallax pages as you would like for a fun and interactive website. Other features include multiple page templates, shortcodes and column layouts, a built in image lightbox, 2 blog styles and more. Pinboard v2 is a Pinterest inspired WordPress theme. This new version now includes multisite integration and social sharing features. It allows you to setup your site as a multisite that enables users to sign up and publish posts on your site – so you can create a website just like Pinterest. The Pinboard multisite feature means users can register on your site to create their own micro sites. When posts are published on the micro sites of your network, they are then synched to also show on your main site. Working just like Pinterest. Pinboard has a responsive design and auto stacking layout so it looks great on any device and screen size. It has infinite scroll with posts loading automatically when you reach the bottom of the page, or an option for traditional page number navigation. You can use Pinboard to publish various types of media images, videos, galleries, lightbox content such as image zoom, video popup or iframe window. The extensive media support allows you to use it as a blog, portfolio, gallery, or video site. Other features include 3 post layout options (small, medium and large grid), author avatar picture, 7 theme skins, theme options panel and more. Piazza is a responsive ecommerce WordPress theme from ColorLabs. 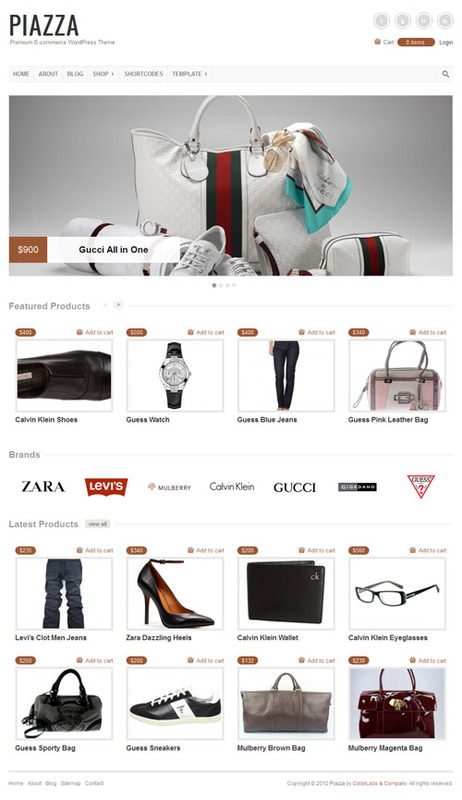 The premium theme has a highly customisable, minimalist and professional design ideal for selling fashion items, accessories, luxury goods or any other products. It has a product centric homepage layout and wide featured slider to highlight featured, popular and latest products. Piazza is compatible with the most popular ecommerce plugins – WP E-commerce, Jigoshop and WooCommerce. The responsive design means it will automatically adjust and display perfectly for users on all devices from desktops to mobiles. Mustache is a flexible, single page WordPress theme for business / portfolio websites. The beautiful premium theme from cssigniter is ideal for professionals, creatives and small businesses that only need a simple and attractive single page website. It has a mobile responsive design so it’s accessible on screen sizes and mobile devices. You can hide or reveal sections as you like, and has over 20 custom icons for the skills section. The backend options panel allows you to quickly set it up and easily manage and change all the options. EcoChic is a unique premium WordPress theme from iDesignEco. The theme has a custom homepage with a dynamic tile section that shows off posts from a category of your choice as a cool looking tile gallery of tiny thumbnails. It also has a slideshow and featured snippets section. Other features include a theme options panel, custom widgets, light and fast code, integrated blog and more. Elastik is a beautiful premium WordPress theme from WPZOOM that uses jQuery Masonry functionality to display posts in a perfectly fluid grid layout. The theme supports post formats so you can easily post different content types such as video, images, galleries, posts etc. The masonry grid structure and responsive design means the number of columns and the layout will automatically adjust depending on the screen size ensuring your site is mobile ready for iPhones, iPads and other mobile devices. Some of the other features include a customisable featured slider, numerous custom widgets, custom header and the ZOOM framework and options panel which gives you lots of flexibly and options to easily customise colours, fonts, and lots of other elements in the theme. 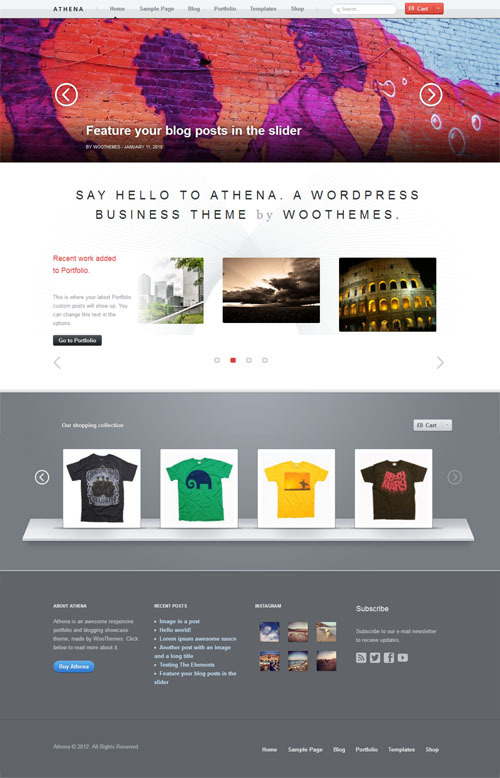 Athena is a responsive business WordPress theme with a clean and professional design from WooThemes. The theme comes integrated with WooCommerce support so you can use it as a business ecommerce site to sell products and services. Anthena can also be transformed into a blog theme, a purely business-focussed website, or a personal nameplate homepage with a few tweaks in the comprehensive theme options panel. Other features include a custom homepage, responsive featured posts slider, powerful portfolio management options, custom Google fonts and typography, 6 colour style options, and a fully responsive design that will scale to fit on all browser widths/resolutions and on all mobile devices.